This machine has been released through years of research and development. Low horsepower, low speed, it can save 50% power at least. Low noise. Special blade design, whose shredder blade life is 3 times longer than the general shredder in the market. Electricity cost : save more than USD 7,200 / year. Blade cost : save more than USD 11,000 / year. KOWIn for test run. International OEM required is welcome too. 1.PET bottle breaking : Able to do shredding & label removing. To reduce the big space requirement due to batch process by large trommel, and reduce more than 50 % powder produced. 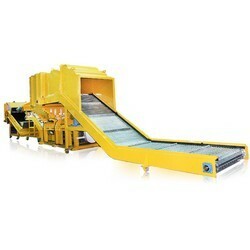 2.Pallet breaking : Directly shredding & crushing. Reduce the cost of crushing process. 3.Large drum breaking : Directly shredding & crushing. Reduce the cost of crushing process. 4.Wood breaking : Blade life is 3 times longer than general shredder. 5.Tire breaking : Blade life is 3 times longer than a general shredder. 6.Various kind of electronic products breaking : With slowly speed crushing, it reduces blade wear and unnecessary powders. Because there are too many small metals attached with electronic products ; With blades of precision alignment and angle arrangement, it reduces the problem on metal damaging the blades.